I just received my Memorial Bracelet today...and I absolutely love it! 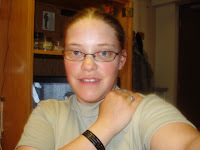 Attached is a picture of me wearing the bracelet. I chose your site because it was the only one I could find that would allow me to include both names on the same bracelet...I'm only authorized to wear one in uniform. Our story is this. Before we joined the Army, my husband, the first name on the bracelet, his brother, my best-friend, the second name on the bracelet, his brother, and myself all stayed together because we had no one but each other for various reasons. My husband's brother was the first to join the Army...he's currently on his third tour in Iraq. Shortly after, my then fiancee (we were married according to Canadian law, but not according to US law, so according to the Army, he was my fiancee) was next to join the Army. Around the same time, my best-friend's girlfriend died giving birth to their daughter. As soon as my best-friend and I turned 17, we joined the Army together, leaving his daughter with his brother. In January of 2006, my "fiancee" was killed in action ten days prior to our American wedding. In March, I lost our son at about six months. In April, my best-friend, who'd been in the same unit as both my husband and his brother, was also killed in action. I know have joint-custody of his daughter with his brother. I wear a ring on my wedding finger with three diamonds, one for my husband, one for our son, and one for my best-friend that was given to me by my husband's brother and my best-friend's brother...and now I wear the bracelet with both of their names.